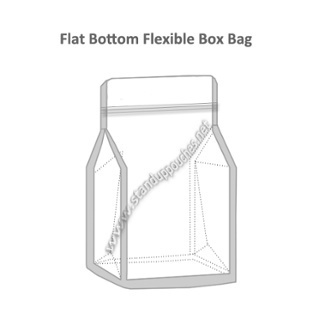 Flat bottom flexible box bags are the innovative alternative to a folding carton or corrugated box. Unlike a bulky box with an ineffective inner liner, flexible box bags have a small footprint and keep products fresh longer. No more squeezing big boxes into the cupboard and rolling up liner bags once the product has been opened – flexible box bags make it convenient for you and your customer to store, transport, access, and consume your quality product. Our customers use flat bottom flexible box bags to package anything that would traditionally go in a box with an inner bag, such as cereal, granola, crackers, and snacks. The flat bottom mimics a box, allowing the pouch to stand effectively, while side gussets provide more space for labels and branding than traditional stand up pouches. Best of all, our flat bottom flexible box bags use up to 15% less film than typical stand up bags, but hold more volume. Each bag has five printable surfaces perfect for brand building, can be printed in up to 12 colors, and is available in clear, metalized, and foil structures. Functional ziplocks top off our flexible box bags, guaranteeing that your customers can easily reach their fresh, favorite products again and again.